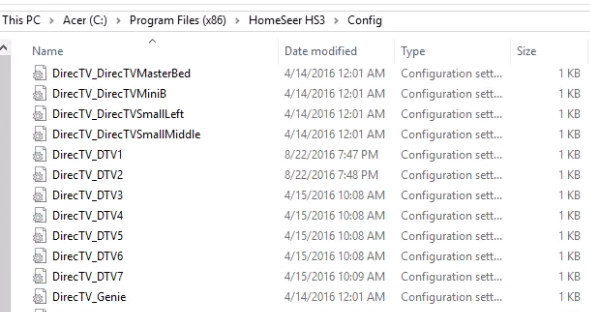 I was updating a different plugin and it froze Homeseer. I restarted and all my plugins were disabled. When I enable DirecTV, it doesn't remember all the different instances so I would have to redo all configurations. I can still see the different instances in config folder, the plugin just doesn't "see" them. Any Idea how I can get the instances to show back up without creating them again. I have 7 boxes so it is quite a chore to add them and I have to rename each box as before or I have to update all the HSTouch screens. what do you mean by "it doesn't remember all the different instances" ? if the ini files for the DirecTV instances are still in the Config folder, and if you start one instance with a name that already existed, it should read the config from the existing ini file. I am going to try to label it the same and see if it works. Ok, adding the instances back worked. I wish I would have known that last time but I didn't ask so can't fault you. I have 7 boxes so it was a lot of updating since I named the instances different as to not overwrite them.